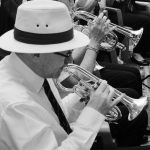 Alister started playing trumpet at 9 years old in the Stowmarket Schools’ Concert Band. Although the band used trumpets and french horns, it was set up a brass band and was known for producing professional players, army musicians and music teachers as well as hobbyists. During his 9 years there, Alister, worked his way through the 4 individual component bands and went on 5 overseas tours, most memorably to the USA and Canada. Alister has only briefly ever lived in Rugby, travelling from Shipston-on-Stour for 18 years before a move to Lichfield in 2008. Living in proximity to other bands, Alister has helped many, becoming friends with many players from Bilton and beyond. Consequently, he recommends banding as a way of developing life-long friendships.